This Now Hiring Friendly Sales Associates adds a sense of immediacy and defines the intended hires. You can act immediately by seeing the Manager on duty for an on-the-fly evaluation, or consider the possibilities at RiteAid.com. I always find the help is helpful at RiteAid so their definition of a good employee starts right. 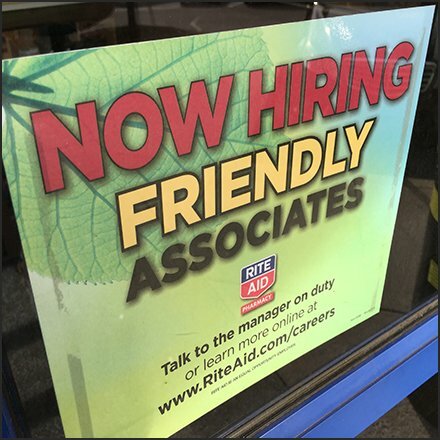 This Now Hiring Friendly Sales Associates seen in Mountaintop PA.